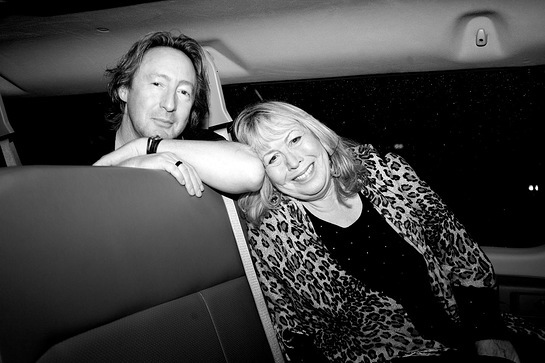 In honor of his late mother, Julian Lennon's White Feather Foundation has announced it will establish The Cynthia Lennon Scholarship For Girls. The initial funding will be in partnership with Connect To Learn, a global education initiative of The Earth Institute at Columbia University, Ericsson and Millennium Promise. With a focus on Africa, scholarships will be provided to ten girls, covering a full four years of educational support for each recipient. In total, The White Feather Foundation is committing to multiple scholarships (in Cynthia Lennon’s name) over the course of five years. For Julian Lennon, the scholarship arose from two events. The first: the April 2015 passing of his mother, a woman who aimed to live life as fully as possible, despite her hardships. Foremost, Cynthia Lennon was an artist and poet her entire life, as well as a published writer/author; a clever, wry woman with a heart of gold, yet nobody’s fool. The second was Julian’s visit to Kenya and Ethiopia in 2014 to witness the positive effects of clean water and education initiatives funded by The White Feather Foundation. An acclaimed photographer, Julian also captured images of local people and landscapes that were subsequently seen in a seven-week charity photo exhibition, “Horizon,” in New York earlier this year. The exhibit continues to tour globally at Art Fairs and gallery exhibits with proceeds from the sale of the collection, as well all of Julian’s collections, going to The White Feather Foundation. The Cynthia Lennon Scholarship For Girls will launch by focusing on the Sauri region of Kenya (according to UNESCO, 56% of secondary-school aged children are actually enrolled in secondary school, where 93 girls are enrolled for every 100 boys in Kenya). This fall, an application process will be conducted, with scholarship recipients chosen in January after exam results are released. The White Feather Foundation will work closely with Connect To Learn to subsequently track the progress of each scholarship recipient, seeking to shine a light on the education of girls in underprivileged regions and to encourage education for all youth worldwide. Julian Lennon founded the global environmental and humanitarian organization The White Feather Foundation in 2007. Its key initiatives are focused on areas such as education, health, the environment and the protection of indigenous culture. The Foundation works with partners from around the world, including The Amazon Conservation Team, Charity: Water, Connect To Learn, Interactions & Solidarity, Lupus Foundation of America, Millennium Promise, Monaco Red Cross, and Studio Samuel Foundation. Please visit www.WhiteFeatherFoundation.com.